If everyone’s watching the ball, who is watching all the other players? Anyone heard the joke about the ref who should buy a ticket to the game because they were ball watching? As a fan, your natural inclination is to watch where the ball goes. It takes will power and self-discipline to overcome that habit. An official that ball watches will consistently miss fouls and violations. It is imperative that all officials understand and focus on their key area of responsibility. That means one official should be watching the ball and the other should be watching what all the other players are doing. Fans watch the ball, officials focus on their primary areas of responsibility. If you are focused on the ball carrier and the defenders immediately around the ball carrier you are the “on” official. If you are watching everyone and everything else you are the “off” official. On and Off ball responsibilities are most easily explained for settled play. As the ball is carried and passed around, officials will switch between being on and off ball. You could be “On” for a minute straight during a strong battle between an attackman and a defender in your area. Or you could switch “On” and “Off” responsibilities with your partner every few seconds, if the players or the ball moves back and forth through the overlapping coverage areas. Both officials need to pay constant attention to their positioning, so they can avoid turning their backs to the goal and the play, and therefore must always be aware of who the “on” official is, who the “off” official is, and when it is likely to change. Examples: A defender pushes or slashes the ball carrier. The ball carrier commits a ward or a teammate sets a moving screen. Concentrate on the space in between the players as that is where fouls occur. Move and reposition yourself to get the best view of the play! Sometimes there is not much going on with other players; they are spread out and stationary. But not always. Off ball movement is key part of most teams offensive strategy. Players will set picks for each other to free a teammate up for an open shot. Sometimes they will try and push there defenders out of the way to create shooting lanes. Sometimes this get quite heated, particularly just above the crease, with players jockeying for position. Here play can go from equal pressure to necessary roughness fouls quickly. As an official you need to develop eye discipline. Its a term you here most often from defensive football coaches when preparing for a triple option team or coaching up their defensive backs or QB coaches on how to look off a safety. The game moves quickly and there is a lot of area to cover, you need to train yourself to look at your key areas instead of watching the game or the ball. You may get away with following the shot as the Trail official as it heads towards the goal, but it will come back to haunt you when the shooter gets creamed and you are the ONLY person in the stadium who did not see the hit. Another mistake officials make is watching the ball. 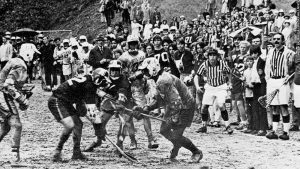 For example, the goalie makes a long outlet pass and the fans, players and officials all look to the sky to track where the pass goes. Who is watching the goalie? Who is watching the intended target? Who is watching the players? Most importantly, the BALL HAS NEVER COMMITTED A FOUL! Instead of looking up, focus on the player passing/shooting if you are the on official or the area you think the ball is going to end up at if you are the off official. Developing eye discipline is challenging and takes concentration and repetition to master. Go over your responsibilities in your pre-game, talk to yourself during the game (e.g. “watch the shooter” or “I am off ball”) and be honest with yourself if you catch yourself ball watching. You can tell yourself you were looking where you supposed to be looking, but film doesn’t lie. Pro-tip: Anyone watching the game film will see where you are looking by noting the direction the brim of your hat is facing. The Trail Official is the On Official whenever the ball is in the Blue-shaded area. The Lead Official is the On Official whenever the ball is in the Yellow-shaded area. There is sometimes overlap between On and Off Officials. This usually occurs as the ball moves from one area of coverage to the other. If there is any doubt or confusion during the game then communicate to your partner by saying: “I’ve got it” or “I’m on,” or “It’s yours!” Non-verbal slap to your chest means that you’ve got the play, while pointing at your partner means that he should be covering the ball. Anything on the line is where both officials are simultaneously On and Off. The general rule of thumb is if the players are moving towards (i.e. you are looking at their front), then you are the On Official. If the players are moving away from you (i.e. you are looking at their backs), then you are the Off Official. 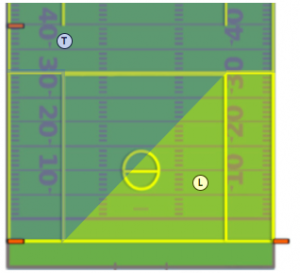 In settled situations there is usually only one flag for a penalty, but the times you will typically get a double flag for the same penalty is when the ball is in this overlap area between both officials. Anytime you have two or more flags get together with your partner to discuss. You might have both flagged the same penalty or two separate penalties at the same time. Any official can make any call from any location on the field, but you had better be sure that you have taken care of your primary responsibility before you fish in someone else’s pond. For the most part, you need to trust your partner, concentrate on your primary area of responsibility, work the angles and call what you see. Officials who attempt to dominate the game by making calls over the entire field do a disservice to their crew. That being said, as we have already noted there is a fair amount of overlapping coverage. This also happens when you are the off official and are looking through the play. Sometimes your partner’s view may be blocked out and they can not see the foul even though they are closer. Be sure it is a foul that needs to be called. It should be blatantly obvious and necessary to assist in managing the game. We do not want to miss any safety calls. But you have to see where the contact is for a slash. In the case of technical fouls (advantage/disadvantage) you need to be 100% certain that a player was disadvantaged; don’t assume that your partner missed it. Especially if you are working with an experienced partner, be sure he is not passing on the call. If it is in your own opinion a 50/50 call and it is not in your area, leave it be. But if you do make a call, you need to sell it and get play restarted quickly. The most important thing is to get it right! It is called the Bermuda Triangle because a lot of weird stuff happens there and it is easy to miss things. On and off ball responsibilities can get confusing in transition as the area officials are required to cover radically expands. In addition, officials are now expected to enforce offsides violation which can be a real challenge for even experienced crews. This is the area that starts at the substitution box, expands along the midline and ends at the far cone. It is called the Bermuda Triangle because a lot of weird stuff happens there and it is easy to miss things. 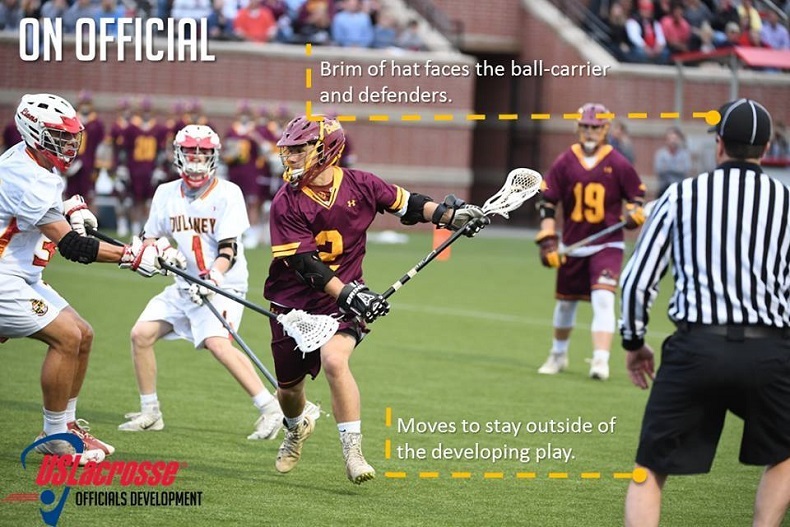 The new Lead official in transition needs to get to the midline in a two-man game and watch for offsides, pushes and holds while the Trail needs to watch for illegal substitutions. And this is in addition to managing on and off ball responsibilities! There is a lot of overlap in this area so be sure to communicate. When a player shoots, responsibilities quickly change. The Lead official must now focus on whether the ball passes the plane of the goal line, watch for crease violations and possible goalie interference. He must also be ready to turn and run to the endline on a contested shot. Meanwhile the Trail official must focus on the shooter and for all intents and purposes, everyone and everything else. The Lead narrows his focus on the goal area, while the Trail official expands his focus. Once the ball is again possessed by either team, on ball and off ball responsibilities resume. A three man game is really a two-man game with help. The Trail in settled situations is that help, but remember in most scenarios, the Trail official take their time getting upfield and into the play. Lead and Single need to work together to cover everything until he arrives. With three officials on the field the same principles we have discussed still apply: we do not need 6 eyes following the ball. Watch the rest of the field. In a two man game it is fairly black and white who has the ball and who does not. If the ball is in the Lead’s area, the Single official takes the crease. When the ball moves into the Single’s area, the responsibilities reverse themselves. There will however be overlap. If the ball falls into the “gray area” between officials, fall back on our rule of thumb: if the ball carrier is coming towards you, you are on ball. Your partners should look off the ball to the crease area. When he is not on ball, the Trail should watch the crease area, especially one on one midfield play, and any late hits or cheap hits on passes or shots. There is a lot of stuff that we miss in a two-man game. The Trail most often shares being the On Official with the Lead and the Single. Remember, often one official’s angle and positioning allow him to see a foul: Look in your area, see the foul, make the call!